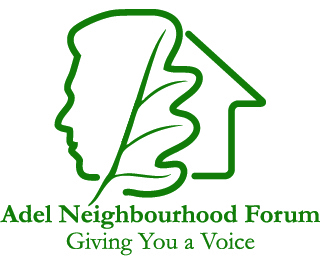 The series of consultation meetings on the Adel Neighbourhood Plan covering land development and related issues for the next 20 years took place in September and October 2016. There was a healthy turnout of around 170 local residents and a steady flow of visitors expressed their support, interest and concerns to Members of the Forum and Cllrs Barry and Caroline Anderson. The main concerns were Leeds City Council’s Site Allocation Plans on the housing developments on green field sites. The green space, cycle ways and paths issues drew encouraging support as did plans for a children’s play area. The comments and feedback from the events will now be reviewed and those relevant and appropriate will be incorporated in the Plan. The next stage will be to send the plan to the Leeds City Council and after its comments have been considered it will be submitted to an independent Inspector to review it against the legal requirements. Once approved by the independent inspector it will go to a referendum of all Adel residents. We need 50% of those who vote in the referendum to approve the plan. The feedback on the formal responses received also the public meeting of 17th November on the proposed development by Hallam Land on the site opposite Adel Parish Church will follow later. The position of the school on the site (not on whether or not a school is or isn’t wanted but in terms of the impact it will have on the properties that surround it). What will happen to the land between Adel Parish Church and the edge of the development site. Invitations have been sent to Hallam Land and to Leeds City Council officers. All Adel Residents and Businesses are welcome.